The line from Ledoux to Le Corbusier is one of an obligation to order, but experienced in a different way. And the demand for an order may be of a much earlier date, going back to the earliest civilizations, facing the same problems. Order is a major issue in those phases of a communication where multiplicity is dominant (like the Second and Fourth Quadrant). A primary objective is necessary for the very moment when the difference between the wood and the trees begins to fade. Bringing order to chaos is the dream of those, who feel the tension at the boundaries of the quadrants on unity (I and III) and those of multiplicity (II and IV). The world of the former (the ‘order’ of unity) is relatively simple, although the understanding of an inclusiveness of the various quadrants in each other complicates the matter. Even the ultimate unity of the First Quadrant, defined as a universe without division, harbors the notion of a potential division and its unpredictable consequences. The ultimate characteristic of multiplicity (or ‘chaos’) seems uncontrollable, but it ‘encapsulates’ an order, like the creation of the CF-graph, as a universal guideline. A book by the Hungarian architect and theoretician Paul LIGETI (1885 – 1940/41) appeared in 1931 under the melodramatic title ‘Der Weg aus dem Chaos: Eine Deutung des Weltgeschehens aus dem Rhythmus der Kunstentwicklung’ (The Way out of Chaos: An Explanation of World History by looking at the Rhythm of Art Development). It is one of those unique books trying to allay the fear of impending troublesome times. Ligeti (p. 131) used the study of classical art history to distinguish four successive periods within a cultural cycle (Kulturwelle): 1. Architecture (Architektur); 2. Painting (Malerei); 3. Sculpture (Plastik) and 4. Music (Musik). The prominence of these types of arts follow each other as a succession of cycles (Kulturpolsschläge) with a duration of approximately 130 years. Fig. 814 – This schema of the four arts represents, according to Ligeti, the relation between the major artistic-historical ideals and their (two-fold oppositional) setting. His four-fold scheme (fig. 814) is not administered to in the rest of his book and brought back to a simplification of the three-fold (p. 171). The fourth or musical phase quickly disappeared from the scene. Ligeti’s oppositional mind was also exposed when he rated the sequence in terms of quality, with a beginning (architecture), a culmination (sculptural) and an end (painting). The three division featured again in his assessment of the first thirty years of the twentieth century. He distinguished in the ‘chaos’ of his times three main political currents: Marxism, Capitalism and Fascism. The first two were concerned with a class struggle (Klassenkampf), while the latter was a reaction to disintegration, anarchistic tendencies and the weak power of persuasion. The struggle between these three components should lead, in Ligeti’s view, to integration with a common denominator. His wishful thinking had to wait for at least half a century, and he did not live to see it, because his Jewish background caused his death in a concentration camp in 1940/41 (HEYNINCKX, 2007). The question remains: what is the relation between order and limitation? An appropriate action in a stage of confusion is the use of ‘Ockham’s razor’ or the principle of parsimony (the entities should not be multiplied beyond necessity), selecting the simplest theory amidst more complicated ones (SPADE, 1999). William of Ockham (c. 1285 – 1347) was a Franciscan friar and scholar, also known as doctor invicibilis. The four-fold way of thinking was common to the Scholastics, who treated the exegesis of the Bible in four different ways: anagoge, allegoria, historia and tropologia. This type of interpretation of the Scriptures was much older and goes back to the first centuries AD. 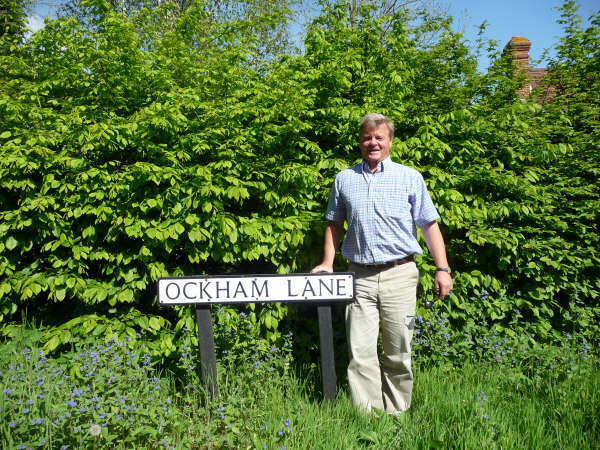 Marten Kuilman in Ockham (England), 17 May 2009. Jean-Rémi ALISSE (1999) realized that the use of Ockham’s razor has its limitations: ‘the blind use of this criterion in science may lead to the rejection of potentially interesting theories, which have yet to undergo further development’. He proposed a new epistemological criterion, which does not reject theories solely on the ground of their complexity. The approach to the study of turbulence and the use of fractals in its understanding is given as an example of a complicated theory, which could easily lose out in favor of the classical statistical theory. Alisse argues that the four types of Jewish exegesis known as PaRDeS (or pardes) can act as a deepening of insight. The term PaRDes (meaning ‘orchard’ in Hebrew, cognate with the Persian word for ‘paradise’) consists of a literal (Pshat), an allusive (Remez), an explicative (Drasch) and a secret sense (Sod). The Jewish points of view are inversely inclusive just like the quadrant in quadralectic thinking. There is also a hierarchy in which each level has a more universal value than the previous one – which is not the case in quadralectic thinking in which all stages are ‘equal’. The Jewish hierarchical sequence would translate in a journey through the Third (III, literal), Second (II, allusive), Fourth (IV, explicative) and First (I, secret) Quadrant of a quadralectic four-division. The world of ideas and propositions (Second Quadrant) asks for a limitation of the field of inquiry. A stream of possibilities comes to the surface and has to be channeled. Boundaries are the first signs of order and have to be respected in that way. The physical boundaries of the Third Quadrant make the obligation to order even more visible. We are only able to see things (in the Fourth Quadrant) if some sort of ordered structures are established. Ideas about an order became pressing in the cultural history of Europe at the end of the nineteenth and beginning of the twentieth century. The leading inspiration in science came from the field of chemistry – with its need to understand and organize the interaction of its smallest components. Fig. 815 – Wilhelm Ostwald (1853 – 1932). The chemist Wilhelm Ostwald (1853 – 1932) (fig. 815) lingered – in the later part of his life – on the philosophical concept of order and developed a philosophy of nature. ‘Do not waste energy, but convert it into a more useful form’ became his ‘energetic imperative’. Ordering took place, in Ostwald’s view, as a process of abstraction to reach for harmony. A theory of order (Mathetik) was the foundation of his ‘pyramid of science’. It could lead to a ‘systematical invention’ and a formalization of the means of communication (Verkehrs-mittel). Organization was the keyword. He published his thoughts in Die Brücke (Munich, 1913), and Die Organisierung der Organisatoren durch die Brücke (Munich, 1914) (HOLT, 1977). The meaning of ‘architecture’ is, in that sense, back to its original intention as a science of proportions, so firmly set by the Roman architect and engineer Marcus Vitruvius Pollio (ca. 70 – ca. 25 BC). His account of known technology called ‘De Architectura libri decem’ (Ten Books on Architecture) described the existing practices in design and construction of buildings, but also various aspects of engineering. The books were written in the last period of his life, somewhere between 31 and 27 BC. The architectural proportions – as representatives of a higher order – were highlighted again in the fundamental disagreement between the French architects Claude Perrault (1613 – 1688) and Nicolas Blondel (1617 – 1686) in the seventeenth century (BRÖNNER, 1972; PÉREZ-GÓMEZ, 1983). The dispute was about the influence of the mind in any observation. An ‘objectively’ and ‘subjectively’ approach were distinguished, conform with the oppositional spirit of the time. Perrault believed that beauty was the result of a subjective interpretation (‘jugement’), while Blondel regarded beauty as an objective ‘natural’ thing. The kernel of the conflict is the position of the observer towards the idea of beauty (in a ‘Second Quadrant’ setting). Blondel takes a ‘Third Quadrant’ stand (II, 3) while Perrault goes for the ‘Fourth Quadrant’ position (II, 4). Fig. 816 – The octagonal baptistery of Saint Jean in Poitiers was one of the few examples of classical architecture seen by Claude Perrault. He later developed – in his ‘Ordonnance’ – a quantitative system to catch the beauty of architectural achievements in figures and bring order into their design. Claude Perrault’s only acquaintance with ‘classical’ architecture was gained during a journey to Bordeaux in 1662. 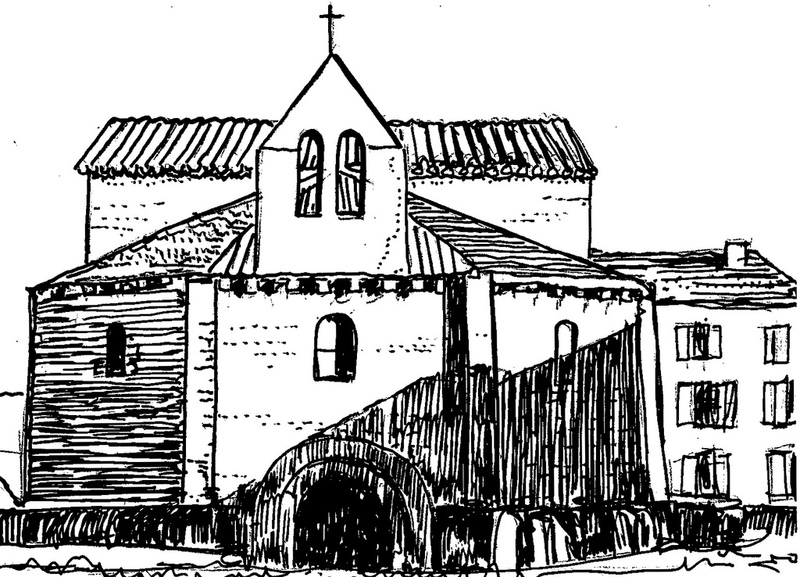 He saw on the way three antique buildings: the Late-Antique Baptistery Saint-Jean in Poitiers (fig. 816), the ‘Palais Gallien’ (a fragment of a third century Roman amphitheater) and the ‘Piliers de la Tutèle’ near Bordeaux. Columns and ornaments had his prime interest. He was only interested in churches and cloisters if they were sumptuously decorated. The Notre-Dame-la-Grande in Poitiers was hardly worth mentioning. Perrault started his assignment to build a triumph-arch on the Place du Thrône in Fauxbourg St. Antoine in 1670. The structure was never finished because of high costs. Portions of the south facade of the Louvre (the Colonnade) and the Paris Observatory (1667 – 1672), however, were finished and prove his architectural skills. He translated and annotated, at the request of Colbert, Vitruvius’ Ten Books On Architecture (1673). Perrault unfolded some ten years later, in his book ‘Ordonnance des cinq espèces de colonnes selon la methode des anciens’ (1683), his theory that the canon of the Classical orders was subject to free interpretation. He understood observation as a psychological process, which left room for the ‘droit du genie createur’. This progressive view on architecture, however, had to be based in a sound theoretical knowledge. In the Ordonnance, he postulated a method that consisted in dividing the major parts of a building in relation to whole numbers. The procedure was based on statistics, whereby the measurements on the various parts of the classical orders resulted in an arithmetic mean. This figure, scientifically derived from the multitude, was, in Perrault’s view, a rational guarantee of perfection and could act as a new source of understanding (and measurements). ‘Perrault was fully conscious of the subversive implications of his system, which amounted to an arbitrary and conceptual construction that was, in essence, disrespectful of the rules of the great masters’ (PÉREZ-GÓMEZ, 1983). Oppositional thinking will break if it is pushed to the limit. That happened in the architectural universe of Perrault in the same way as it led to Gallileo’s view of the cosmos. Anyone surpassing the constraints of lower division thinking is in for a shock. This moment occurs in every (quadralectic) communication in the third stage of the Third Quadrant (III, 3). Others, who remain in the realms of lower division thinking, will be caught in the net of oppositional thinking. That position can, in extreme cases, lead to (religious) fanatics, who blow themselves (and/or others) up for the ‘cause’, or run into a school with a gun to kill innocent children. The mental situation (of extreme oppositional thinking) has been given various names in the world of psychiatry, including schizophrenic behavior and a bi-polaire disorder. The ‘source’ of this human disposition is to be found in the initial setting and flexibility of the type of division thinking. Most of Perrault’s knowledge of ancient architecture was derived from Antoine Desgodetz’ book ‘Les edifices antiques de Rome’ (Paris, 1682). This French architect and theorist (1653 – 1728) was a talented draughtsman, who was sent to Rome on a royal bursary. He spent two years in the city recording ancient architecture. The measurements and sketches were given in the above-mentioned book, for which he was rewarded with the sum of two thousand livres. Nicolas Francois Blondel (1617 – 1686), Perrault’s opponent, was also concerned with the ‘changement de proportion’, but he was eager to preserve tradition. His rationalism can be rated as ‘objective’, devoid of ‘sentiment’. He stated in his most important book (‘Cours d’architecture’) that ‘Les proportions des beaux Bastimens prouvent la necessité des proportions dans l’architecture’. (the proportions of the beautiful (Classical) buildings prove that proportions are necessary in architecture). The base of architecture is in nature. Blondel used, just like Perrault, the inductive method (using specifics to reach generalities) to proof his point. A study of many buildings is necessary to find out what beauty really is. Bad taste and Gothic were in his view almost synonyms. He could make this statement, because he went in 1657 with a mission to Berlin and Constantinople, and also traveled extensively in Greece and Egypt. He was involved in the building of the harbor of Rochefort and the city planning of Paris. The Porte St. Antoine (1660) and Porte St. Bernard (1672) were restyled (now demolished). The Porte St. Denis (1670), inspired by the Arch of Titus in Rome, remained his major work and is still standing today. Blondel’s mission was a journey back to Vitruvius, Alberti, Palladio, Vignola and Scamozzi. He appreciated the precision of these architects and artists, but did not always live up to these measures himself. The antique buildings formed, in his view, a reference base of beauty (but not all ancient buildings were necessary beautiful). Blondel rated the architectural history of Rome higher than the building activities of classical Greece. The seventeenth century believed that all Greek qualities were already present in the Roman art. There was no need to go to the roots – although Blondel traveled in 1657 to Turkey, Greece and Egypt and could make comparisons. These differences in the way of observation have a reference to the activities of Claude’s brother, the writer Charles Perrault, who fought the ‘Querelle des anciens et des modernes’, at the Academie. The Belgian historian Paul HAZARD (1935/1994) interpreted this dispute later as ‘La Crise de la Conscience Europeenne – 1680 – 1715’. (The Crisis of the European mind: 1680 – 1715). It was during this period – also known as the Enlightenment – that Europe became aware of its own, unique character. A quadralectic reconstruction of the history of Europe would place this important development at the beginning of the fourth part of the Third Quadrant (III, 4; 1650 to 1800). The potential freedom from traditional principles, which was implicit in Perrault treatment of the Five Orders, gave half a century later way to the ornamental exaggerations of the Rococo. Order was now unleashed and on the loose. The year 1720 has been pinpointed earlier (fig. 498) as a year of ‘madness’ in the European cultural history. The exuberance of form (inspired by the rocaille, the natural setting of a rock garden) lasted for nearly half century, from about 1715 to 1750, when neo-classical ideas got the overhand and ‘order’ returned. The Rocaille or Rococo style – popular during the reign of Louis XV – was characterized by extensive curvature, following the lines of nature. Shells and acanthus leaves were favorite sculptural objects. The dedication to ornament has its own place in a creative communication. VON WERSIN (1940) proclaimed the ornament as the essence of any artistic experience. Its presence in art is subject to laws (Bildungsgesetz) and regulations, which also holds in music and poetry. He distinguished two main groups: an open, rhythmic ornament based on similarity and a closed, organic ornament with an internal dynamic. The first group is characterized by a regular repetition, while the second group is represented by a single, dynamic composition. A modern interpretation would distinguish a multiple environment (II and IV) and an individual setting (I and III). The quadralectic approach does not fear this ‘a-scientific’ setting of style. An investigation into an ornament (as ‘typical element’ of visibility) can shed more light into this matter. Wolfgang von WERSIN (1940) gave a short and clear expose of the nature of the ornament. He saw the embellishment as a branch of art, in a general sense. It is applicable to simple and complicated structures, orderly and disorderly arrangements and is not limited to a certain historical period. Maybe an ornament comes closest in its versatility to the rhythm of music. Ornamentation can act like a language or a dance (in a Fourth Quadrant environment guided by feelings). Von Wersin approached the description of the ornament in classical, dualistic terms by using polarity as its main content (fig. 817). Contrasting pairs (like up and down, curved and straight, black and white, etc.) interact within the ornament. The aim is to find a new unity by balancing out the oppositional forces. This state of visibility can be achieved by repetition of the same (a part) or by the dynamism of the motive itself (in multiplicity). Fig. 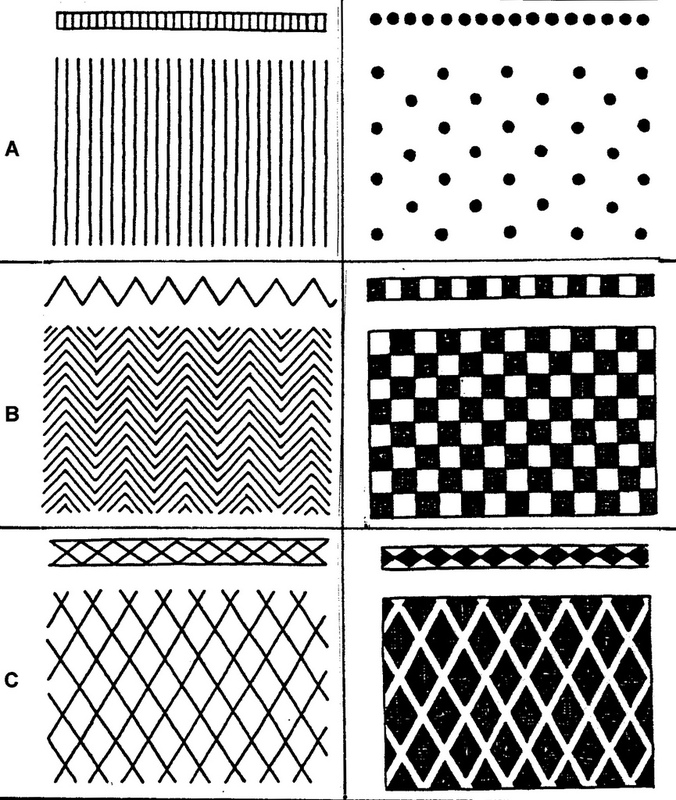 817 – Some examples of the main ground principle of the rhythmic ornament as distinguished by Wolfgang von Wersin (1940). Von Wersin’s approach to the ornament in the rest of his book is two-fold: an ornament is, in his view, the result of the visualization of opposition in a communication. 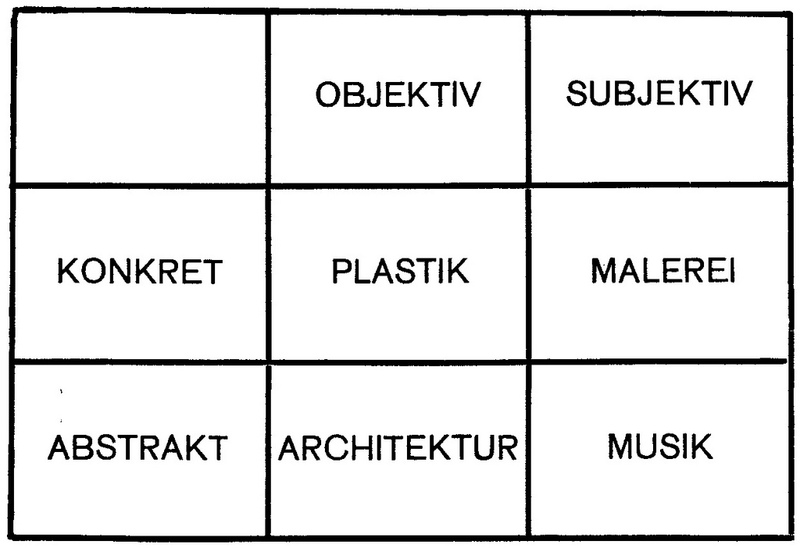 The ornament is created in a game of choices between oppositional entities (Gegensätzen). The ornament is in this approach firmly placed in a Third Quadrant environment. This situation does not contradict with the position of, for instance, the Rococo period in the fourth part of the Third Quadrant (III, 4) of the European cultural period (1650 – 1800). Von Wersin’s distinction of three main types of polarity in the formation of rhythmic ornaments fits in the psychological setting of the Third Quadrant. Polarity is a binary attribute, which is typical for the oppositional environment of this quadrant. 1. Polarity between a unity and its environment (Intervall). The similarity of form manifests itself in a simple row with intervals, either in a continuous (linear, fig. 817A, left) or a discontinuous (fleckhaft, fig. 817A, right) setting. The direction (Richting) can add an extra dimension to the pattern. The main prerequisite for this type of ornamentation in its rhythmic continuity is an internal contact or crossing of the individual elements. 2. Polarity between contrasts (Wechsel). The element of contrast and inversion (Umkehrung), like light-dark, straight-curved, etc., but also the use of different contrasting colors, between the pairs is essential in this type of ornamentation. The pattern row can be in a continuous (fig. 817B, left) and discontinuous (fig. 817B, right) fashion. The reciprocal symmetry of the pattern provides an alternating impression (Zweitakt), which is stronger in its internal cohesion than the previous type. 3. Polarity by crossing (Überkreuzung). The contrast is now coming from two directions, creating a new static order – which is so typical for the symbolic meaning of crosses in general. All grids and interweaving patterns are based on this type of polarity. Again there are linear (fig. 817C, left) and mottled (fig. 817C, right) types. The former emphasizes the crossing points and the direction of the lines, the latter focuses on the area between the lines (fig. 818). Fig. 818 – This mosaic from baked clay was found in the ruins of Uruk, Babylon and dated from around 4000 BC. Type B (contrasts) and C (crossing) of rhythmic ornaments can be seen here. 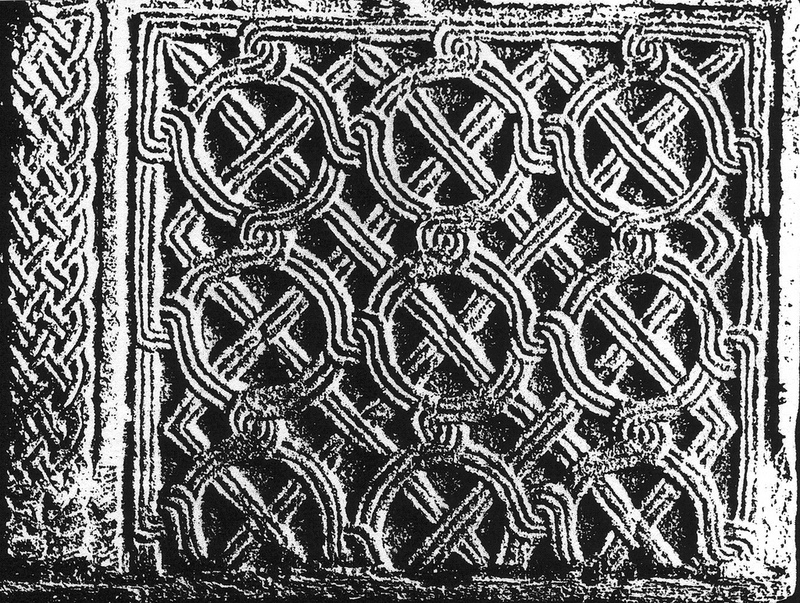 Weaving patterns, like those of Greek, Roman or Celtic origin, might be the ultimate delight in ornamentation, because they contain the mysteries of their complicated generation (fig. 819). The search for these patterns will start when the presence of an identity in space is realized. The moments of enthusiasm for these patterns are therefore, situated at the early stages of visibility – when the joy of higher division thinking has emerged in the psychological setting of the communication – or at its final stages, when a new kind of freedom is discovered. Fig. 819 – A regular waving pattern in a Roman choir of the Ilmmünster Abbey in Bayern (Germany) is an example of ornamentation with a four-fold impression. The original Benedictine monastery was founded in about 762 AD by the brothers Adalbert and Otker. The year 750 AD was chosen as the beginning of the visible visibility period (X) of the European cultural history (750 – 2250). The creation of order is a matter of decisions, which are taken in the earlier stages of a communication. The choice of a particular type of division thinking marks the outcome of the whole interaction, since it will influence the validation throughout the communication. The Celtic cultural presence, long before the period of the ‘real’ European ‘visibility’, has been an important source of inspiration to establish order in the European mind when it came to blossoming. The artistic explorations in regular weaving patters – from jewelry to book illustrations – are a manifestation of multiple division thinking. The search for an order in chaos is the creating source of their craftsmanship. The ingenuity of patterns surpassed all imaginations. However, in the execution of these patterns resides a strong kernel of oppositional thinking. It could only be achieved in a dual world of an extreme long and an extreme short time consciousness. It belongs in the same league as mosaic making and tapestry weaving. Le Corbusier believed that the plan of a building is the motor (‘Le plan est le générateur’). The outcome should satisfy the soul (‘procure la satisfaction de l’esprit’) by an obligation to order (‘obligation de l’ordre’). This order could counteract the arbitrary (‘assurance contre l’arbitraire’). He did not like the ‘pack-donkey’s’ way of design and building, which ‘meanders along, meditates a little in his scatter-brained and distracted fashion’ (Le CORBUSIER, 1929/1987). He was not yet aware – which is clear from his proposals in city building – that his reaction against ‘meandering’ was a sign of not reaching the world of higher division thinking. The CF-graph is, in the latter environment, the evidence of a successful tool to counteract the ‘chaos’ of the multitude. 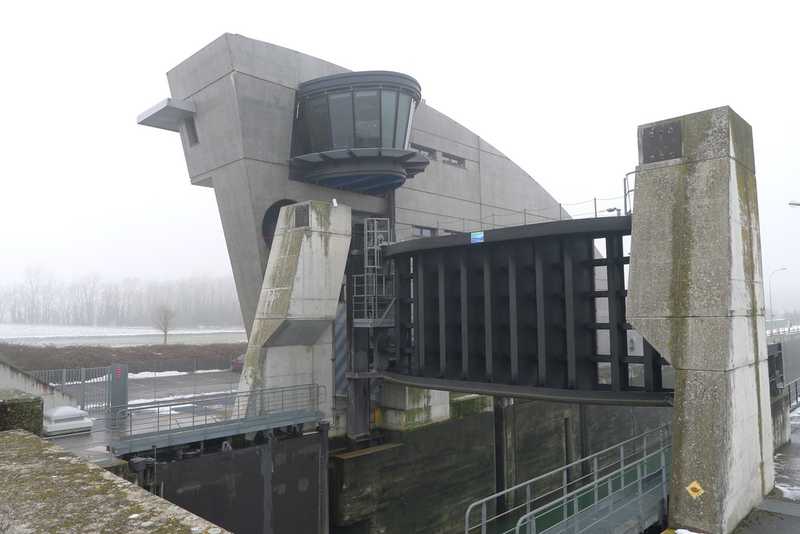 The Ecluse at Niffer, designed by le Corbusier (1961). Niffer is a commune in the Haut-Rhin department in north-eastern France (Photo: Marten Kuilman, Jan. 2013). 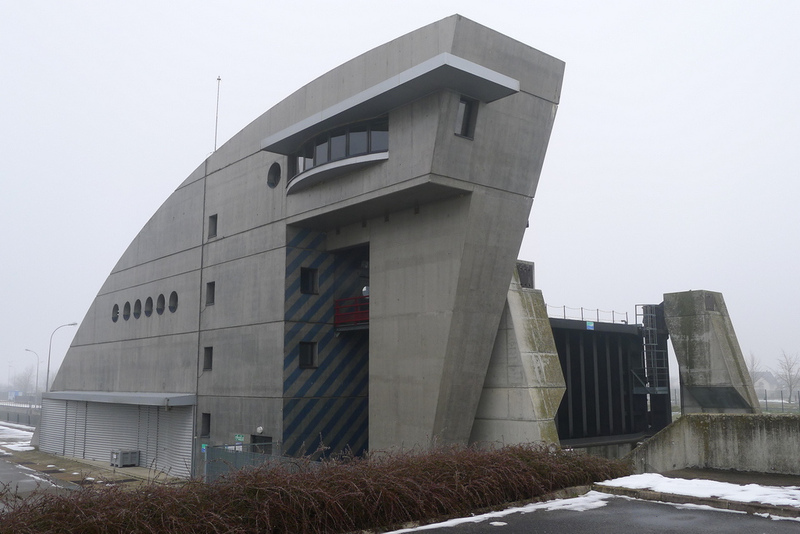 The Ecluse in Canal du Rhone au Rhin at Niffer (France) designed by le Corbusier (1961) (Photo: Marten Kuilman, Jan. 2013).